Luke Maye was a very average college basketball player. Last season, Maye played just 32 percent of possible minutes for North Carolina. When he did play, he was exactly what you’d thought he’d be. A former preferred walk-on, doing what he could and only what’s asked of him. Maye was a glue guy in every sense of the phrase, pitching in 5 points and 3 rebounds per game. He scored in double-digits six times and peaked with a career high of 17 points against Kentucky in the NCAA Tournament – in a game in which he hit the buzzer-beating game winner. His scoring total that day was a total surprise, as was his moment as the Tar Heels hero. Despite that stellar day, it was clearly an outlier. Overall, Maye was the exact kind of player every National Champion needs on its bench. A large portion of that Tar Heel title-winning team left as graduates or early entrants to the NBA, leaving Maye with an increased role this season. Given what he’d shown in the past, most outsiders expected him to see more minutes and produce more, but still be secondary to his teammates. There was no indication that Luke Maye would ever be an All-Conference level player. Instead, he’s returned this season and been an absolute force. Inexplicably, Maye has looked not like an All-ACC performer, but like an All-American. In six games so far this season, Maye is averaging 19.0 points, 10.0 rebounds, and 2.5 assists per contest. He topped his previous career high of 17 points in four of this year’s games already. That list includes a brilliant 28 point, 16 rebound, 5 assist game against a very good Arkansas club. All of Maye’s averages have actually fallen from their peak since Maye actually looked human against Michigan State, posting just 8 points and 6 rebounds on a cold shooting night. Even with one lackluster performance on the docket, Maye has increased his field goal shooting percentage, 3-point percentage, and offensive rating. Last season, Maye attempted 40 three-point shots in 35 games. He’s already hoisted half that many longballs in six games this year, and is shooting a better percentage. Good things are happening almost across the board with the ball in Maye’s hands. Despite a bump in usage rate, he is even turning the ball over at a lower clip. Looking at all the numbers, it’s clear that this isn’t just a case of an efficient player receiving more minutes and opportunities. All of Maye’s percentage and per possession stats are up just as much as his counting stats. Diving deeper, there’s no clear statistical reason for the improvement either. He’s shooting the same percentage of his shots at the rim versus jump shots. His usage rating is certainly up as I mentioned, but only from 19.7 percent to 25.0 percent. That’s in the same ballpark, not the difference between a shy shooter and a go-to-guy. So then, what the hell happened to Luke Maye? I think it’s safe to say even though Maye is listed five pounds heavier this year, that we can chalk that up to muscle weighing more than fat. Shedding some beef would certainly explain how Maye has handled playing twice as many minutes, though it doesn’t quite answer question about his shooting and play-making improvements. I think the differences in Maye’s game can be attributed primarily to two causes. First, as the Michigan State game showed, this is, in some respects, an aberration. Now that teams have some tape on the new Luke Maye, they’ll make things a bit more difficult than they’ve been to date. Three of his 20-plus point games came against Bucknell, Northern Iowa, and Portland. Those are all solid teams, the first two in particular, but they don’t feature the kind of athletes Maye will meet in the ACC this season. Basically, as fun as these wonderful Maye days have been, I’m not so certain they’ll continue. Second, I think it’s clear that Maye has always been skilled, but playing with Justin Jackson, Kennedy Meeks, and other scorers decreased his chances to contribute and his confidence in the offense. Carolina is now running plays to get Maye the ball all over the floor. Roy Williams has drawn up sets to get Maye post touches and staggered screens to have him launch an open three. At a certain point this year, the question needs to be asked: Did Roy Williams not know what he had on his roster last season? Starting power forward Isaiah Hicks scored a modest 11.8 points for the Heels last season and was a valuable cog for that team. Hicks averaged fewer rebounds per 40 minutes and lower offensive and defensive rebounding rates than Maye last season. Not to mention, Maye is a career 41 percent outside shooter with a credible sample size at this point, while Hicks did not attempt a three-point basket in his final two seasons as a Tar Heel. Even if Maye’s current success makes it look like he deserved more minutes and more responsibility last season, North Carolina uh, WON THE NATIONAL CHAMPIONSHIP. Nitpicking Roy Williams’ rotation moves makes a lot less sense considering they cut down the nets at season’s end. I understand how silly that sounds, but I’m just just trying to come to grips with how well Luke Maye has played this year. You’ll have to forgive me, and every college basketball junkie, for freaking out about how a former nobody is very much playing like somebody. 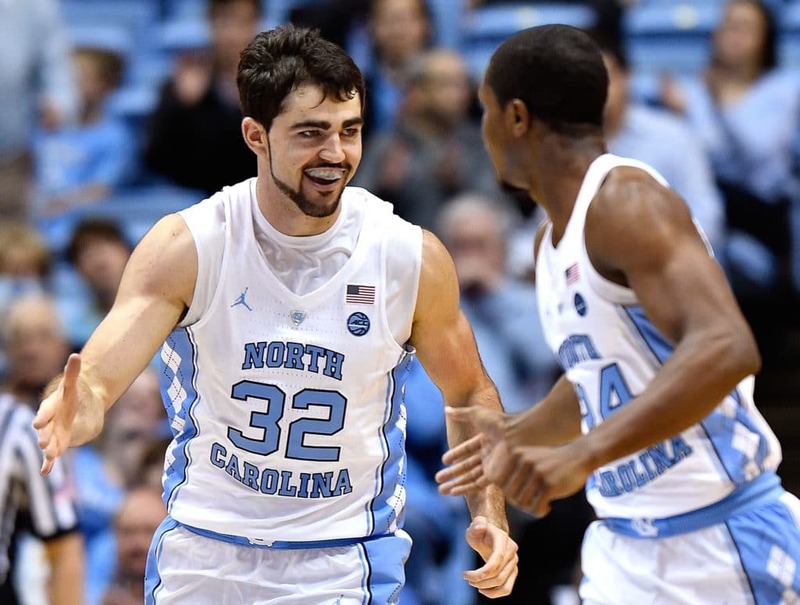 While our minds spin looking for an answer, Luke Maye will continue to score and rebound and impress. He deserves all the credit in the world for building his game into something special. No player in college basketball has been easier to root for this season.